England's women finished third in the Investec Challenge in South Africa after a 3-2 penalty shoot-out win over Australia. The side had trailed twice but Susie Gilbert's penalty stroke two minutes from time made it 2-2. Extra time failed to separate the sides and penalties were needed. Leicester's Maddie Hinch was England's heroine, saving from Casey Eastham and Jodie Schulz while Gilbert, Laura Unsworth and Sophie Bray all scored. England fell behind in the 10th minute to Fiona Boyce's opener for the Australians and despite a period of good English pressure it remained 1-0 until shortly after the break, when Sophie Bray grabbed an equaliser with her second goal of the tournament. Eight minutes later, Kirstin Johnson made it 2-1 to Australia but England kept battling and were rewarded for their efforts when they were awarded a penalty stroke and Gilbert stepped up to score confidently from the spot. 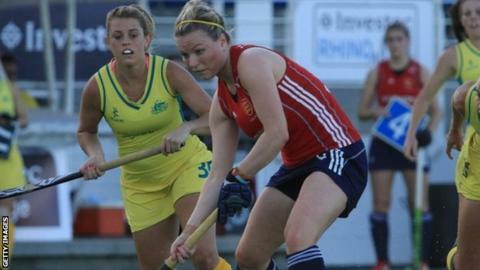 It was England's first win of the tournament after losing to Australia, the Netherlands and hosts South Africa in the pool stages before slipping to another loss to the Netherlands in Saturday's semi-finals. "In patches today we played some really nice hockey," said team leader Karen Brown. "What was probably most pleasing is that we kept battling throughout the entire match. It was hot today and physically demanding."